Both vanities are not damaged. Removing and reusing them is what the insurance will pay for which we aren't upset about because pre-flood, I planned on giving them a makeover anyway. The only issue is a budget one. The vanities do not have a cut out back which makes removing them without destroying the vanity difficult. I ending up smashing the vanity in my vintage modern bathroom renovation to remove it. I don't want to be in that situation again if I can help it. I should have a plumber come in to remove the water shut off faucets and cap the lines so we can lift the vanity off the plumbing. That is in the budget but can mess with our timetable because we have to work on the plumber's schedule, not ours. 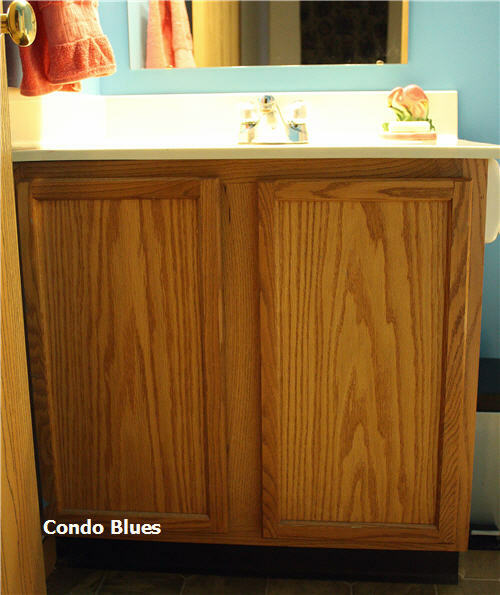 Also on the table is the possibility of DIYing a neat cut in the back of the vanity and lifting it off the plumbing. This is doable knowing what I now know after dealing with the same configuration in the half bathroom. This option will save me several hundred bucks in plumber labor per vanity that I can put elsewhere like buying a replacement vanity. Good gosh by golly this is going to involve a lot of window shopping. I like the thrill of the hunt. Husband would rather chew off his foot caught in a bear trap than aimlessly comparison shop. He's a I see it - I like it - I buy it - I get out shopper. That's why I took (somewhat blurry) photos with my phone so I won't overwhelm him with endless options, just my top three picks after I researched endless options. I like the modern style and I can reuse my current faucet. The sink is shallow but wide enough to use as a baby cradle! I'm not sure how I feel about the open storage below. 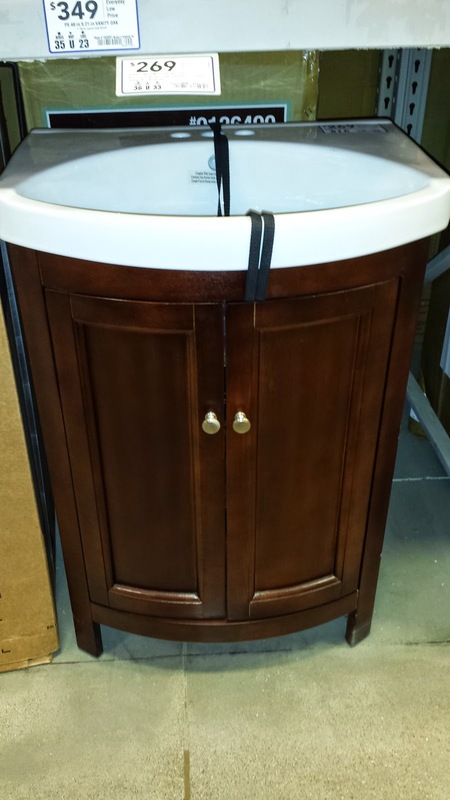 This is vanity is similar to the one above, has a deeper sink, and covered storage. 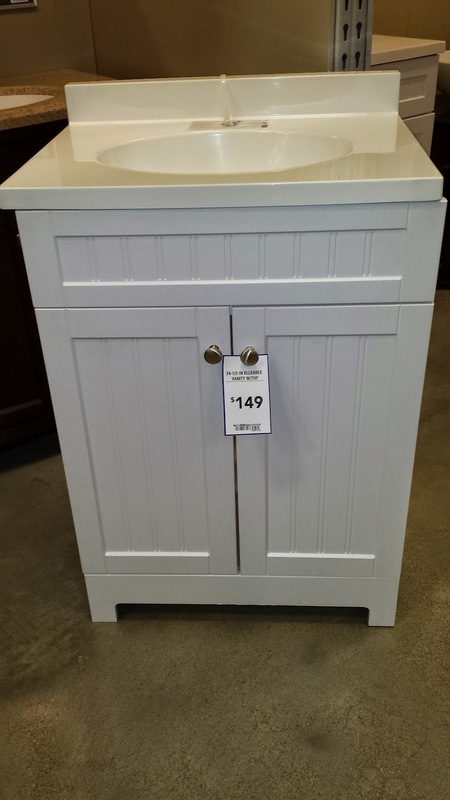 Size isn't an issue because like most of the vanities in this post, I can order in a different size than what they have in the store display. I like the Craftsman style. 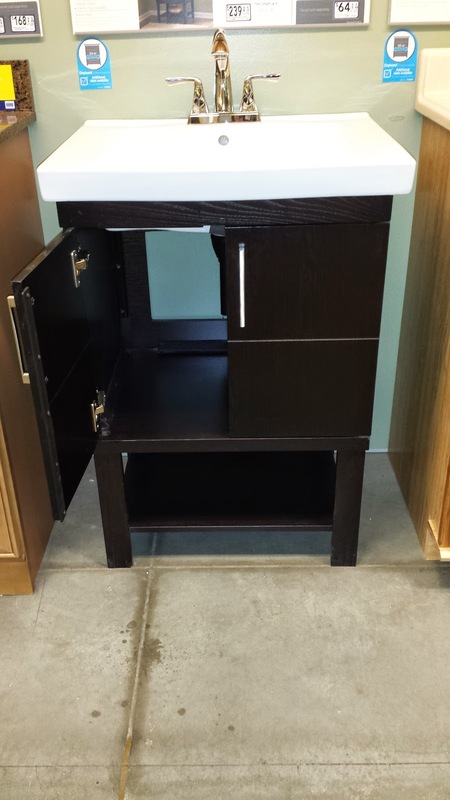 A vanity with drawers would be a storage dream come true for the master bathroom. If they make a corner model of the storage tower, I'd consider it. We need storage wherever we can add it. I plan to keep the beachy vibe I already have going in the guest bathroom. 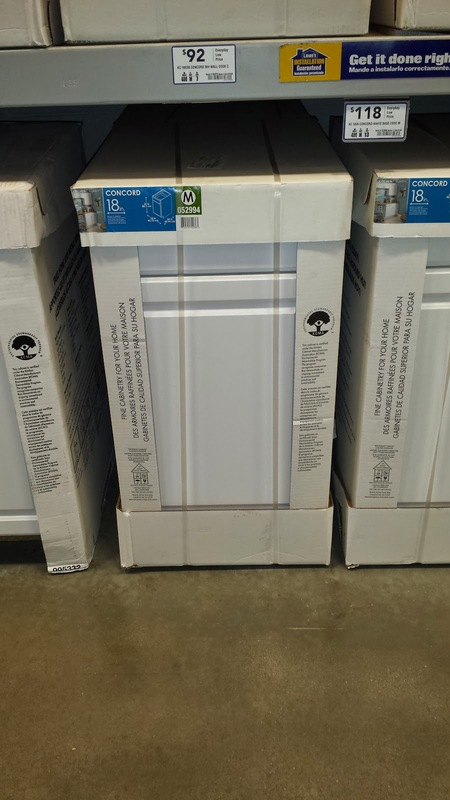 My guest bathroom vanity makeover plan includes painting it white. This bead board vanity is in line with that vision. I also looked at stock cabinets since that's what I already have and it fits into out timeline. 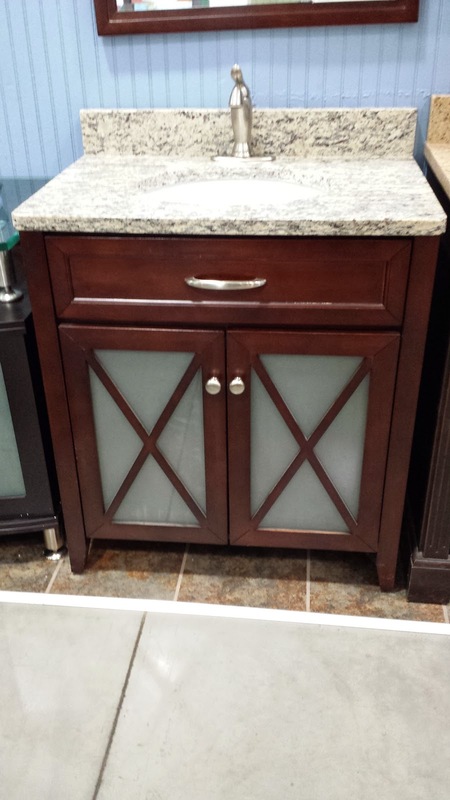 If this style cabinet came with the house I'd be fine with it. I'm not loving this one as a replacement in the guest bath. Husband and I like dark wood tones. The curved front and doors are different in a good way. 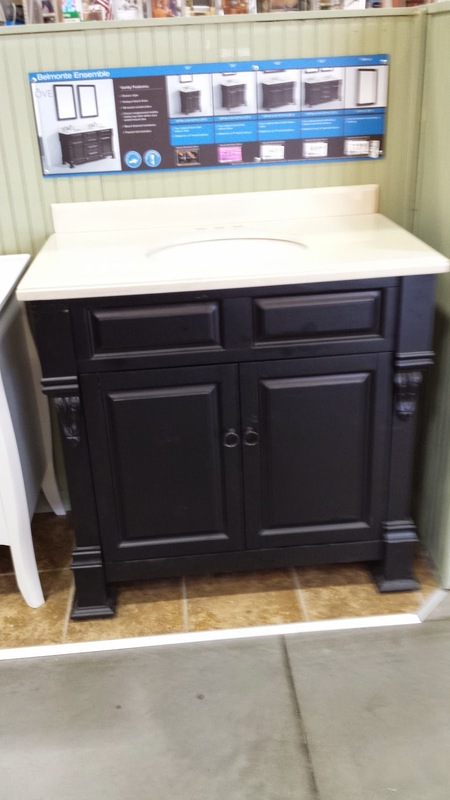 This vanity could be in the running for the master bathroom if they make it in a double vanity. Love the color and more modern style. I planned on doing something similar to the doors of a current vanity. As long as the door panels are glass instead of cheap plastic, this one could be in the running. 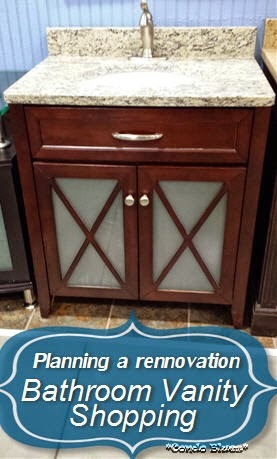 I'd pick a different counter top though. Heeeeeeelllo beautiful! This one made me stop in my tracks. The dark color will work with the current wall color in the master bath. 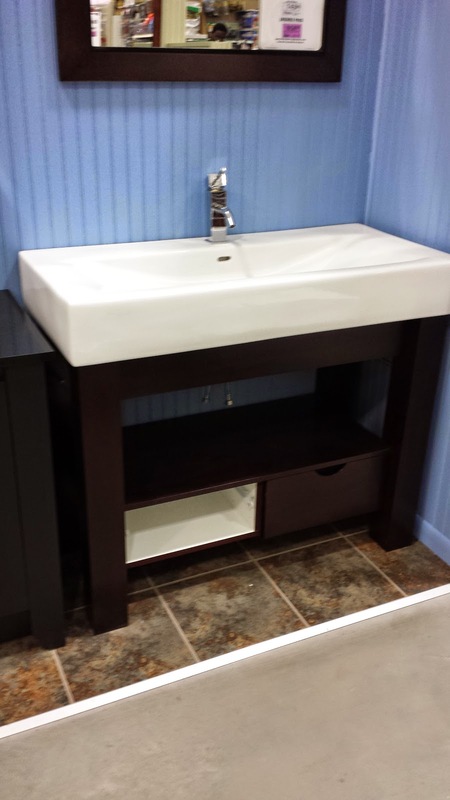 The double vanity comes with a set of drawers. I like the leg detail. It reminds me of antique dresser. I also think I can buy similar design elements from the makers of my master bathroom vanity and get this look for slightly less. And speaking of bathroom vanities that look like furniture, making an old dresser into a bathroom vanity is not off the table either. 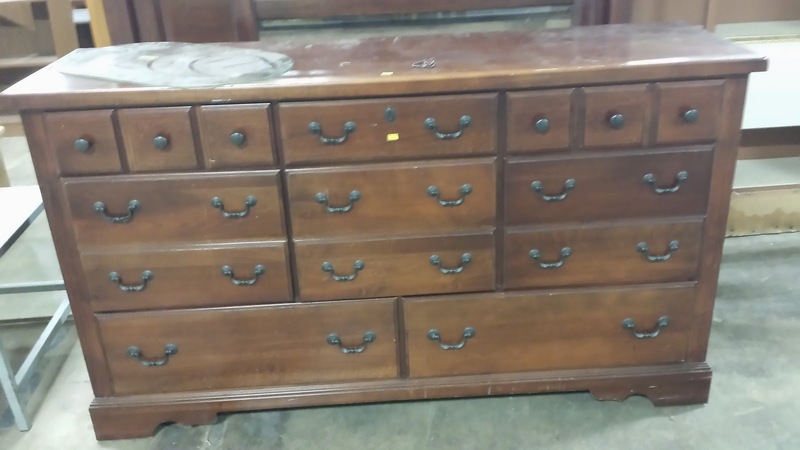 I found this dresser at the Restore that could be a bathroom vanity with a lot of work. 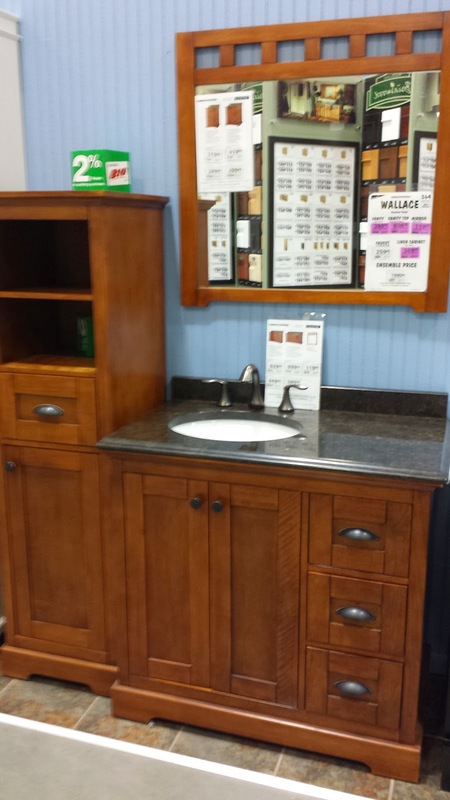 Do you see any bathroom vanities you like?